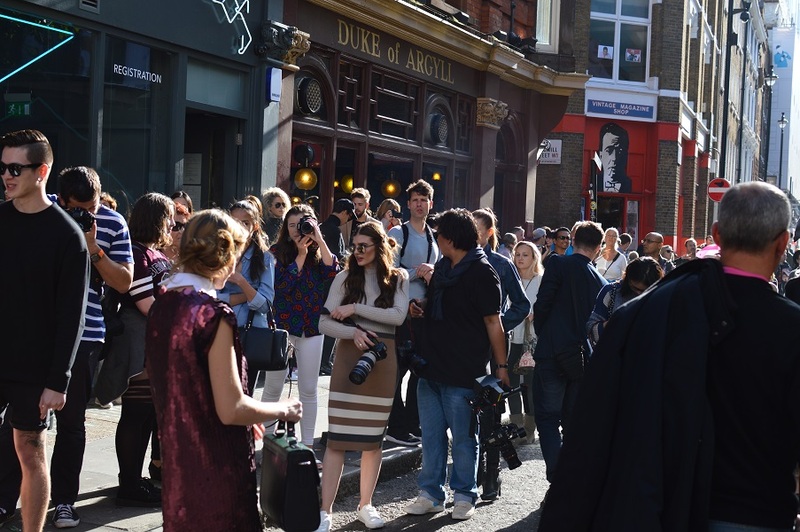 Oh London, you are beautiful, ugly, classy, tacky, hot, cold, conservative and crazy, all of this embodied in the audience visiting London Fashion Week. For me, the trotting around the shows is the real magnet to come to LFW: To be inspired, to soak up the creativity and to meet new interesting people. 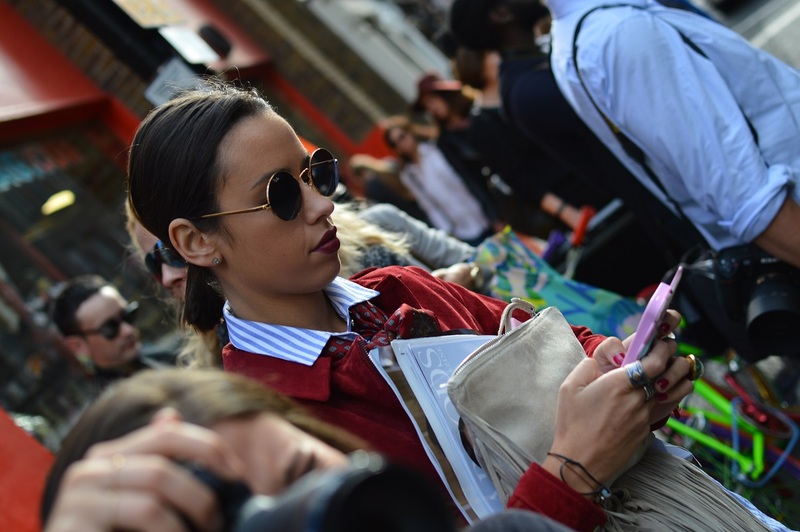 Enjoy my pictures taken of best and worst of LFW Street style. Above: Mirrored blue aviator Ray Ban: Check. Heavily pigmented pink lipstick: Check. Must-have furry coat: Check. Effortless cool. 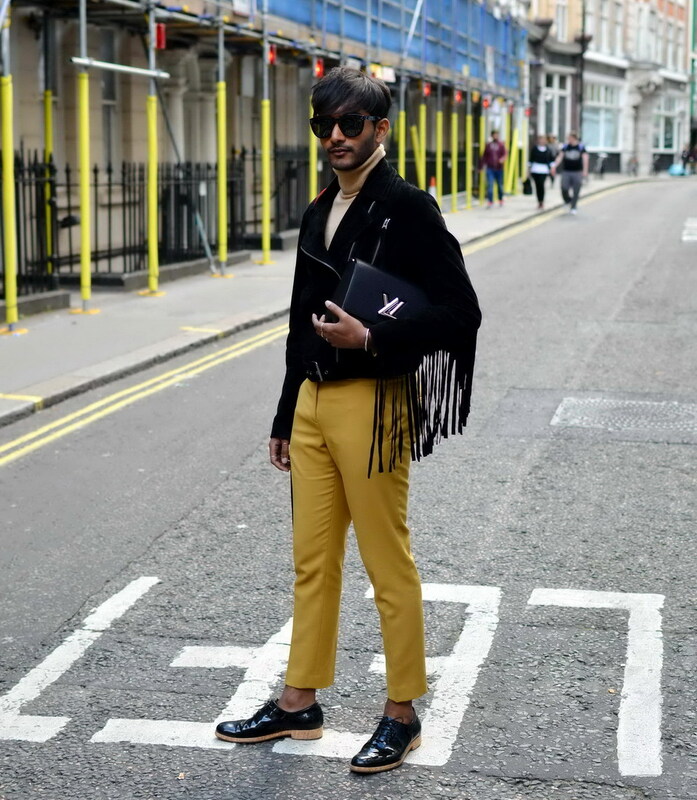 I could never wear this combo but this stylish creative pulls it off to perfection. Wow, she has attitude. I love her expression while I’m pondering if the head mask it the new trend for 2015. I adore this look in all it’s simplicity: Snakeskin printed loafers, cream trousers, baby blue winter coat. LFW in February is freezing so getting a break from the chill is essential to recharge batteries. The blue Nike trainers lend the black leather pleated skirt and the thick woolen tights some edge, while the silver puffer jacket keeps this Fashion-week-goer toasty. This skirt length is so difficult to pull off as it makes most people (including me!) look small and disproportionate. However this fashionista nailed it! Pointy heels elongate the leg and the ankle straps emphasise skinny ankles. Love the blue A-line skirt from COS.
It’s the time of the year again for London Fashion week at Somerset House. 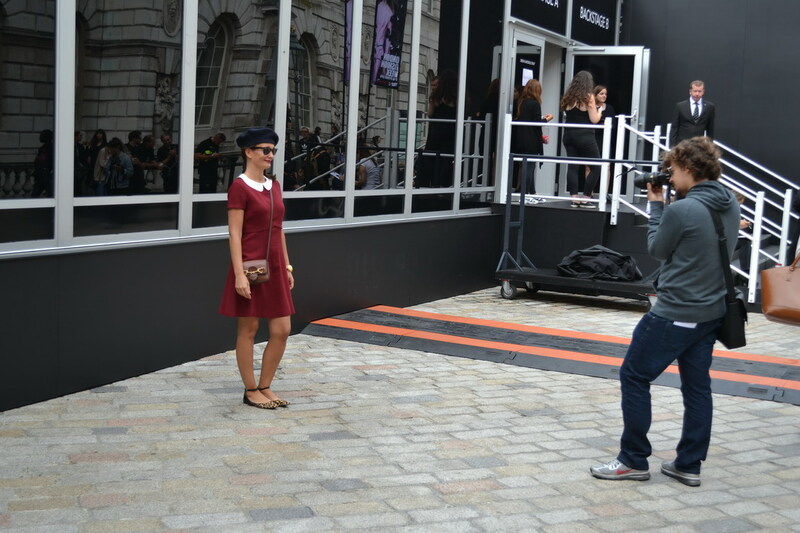 Whilst the shows themselves are for invitation holders only, a lot of the action happens in the courtyard of Somerset House – via a huge live screen you can follow the shows, visit many of the side shows hosted by Topshop and River Island, pop into a blow-out or braid bar or have a coffee at Tom’s diner to relax from all the excitement. This year, I left Rebel in Hamburg as we just spent a sisterly weekend together in Paris. 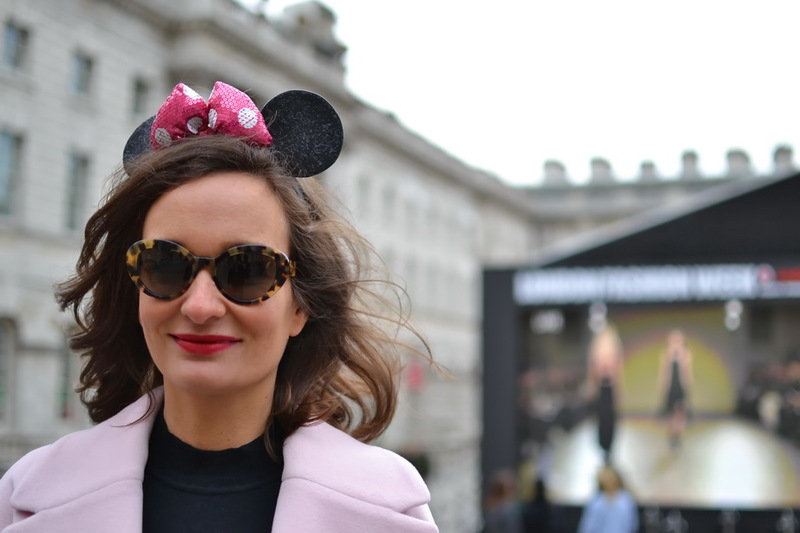 With Mr Romantique in tow, I threw on my favourite pink coat and Minnie Mouse ears. When going to London Fashion Week, I’m never trying to keep up with the fashionable London crowd – they are way to eccentric for me. Instead, I stay true to myself and wear what I would wear to the office. I do allow myself one fun, quirky accessory though. Last year, this was a pair of sequinned cat ears. This year, I’m following up with Minnie Mouse ears and a pink bow as the cherry on the cake. 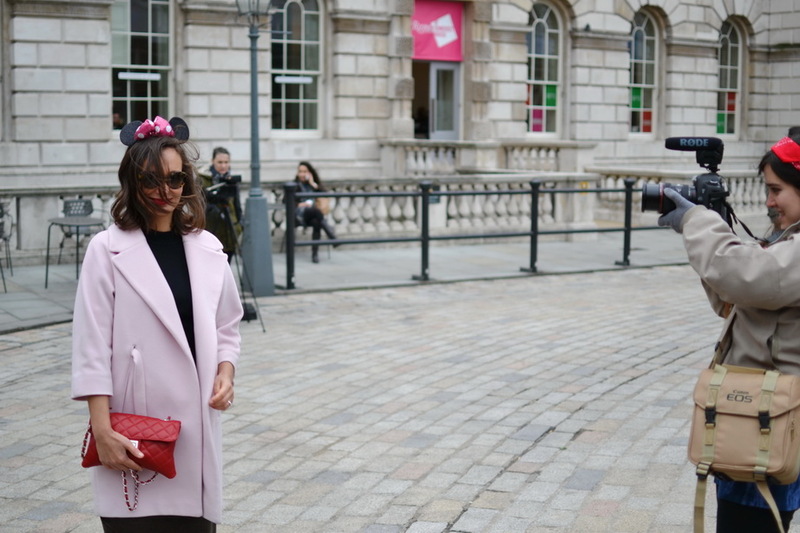 Stay tuned for a full run-down of my favourite LFW 2015 street style outfits. 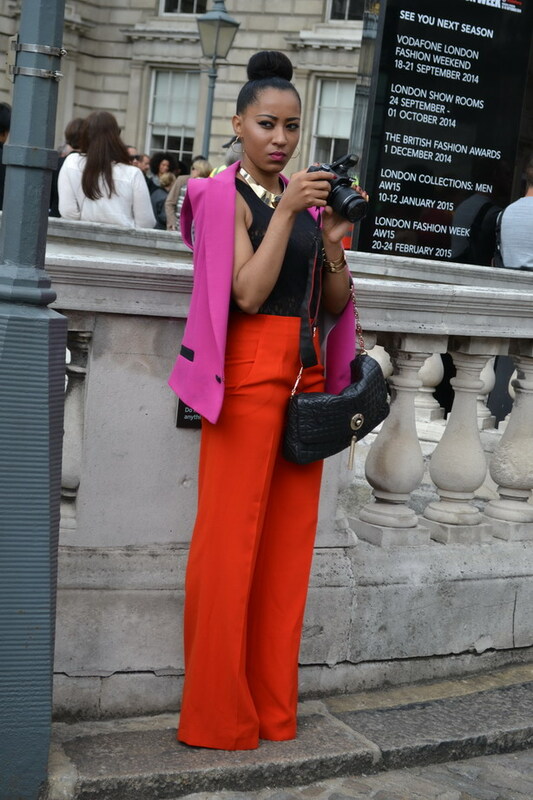 LFW is a great way to meet like-minded bloggers and find inspiration in the many colourful outfits. This floral light blue coat is from ZARA. 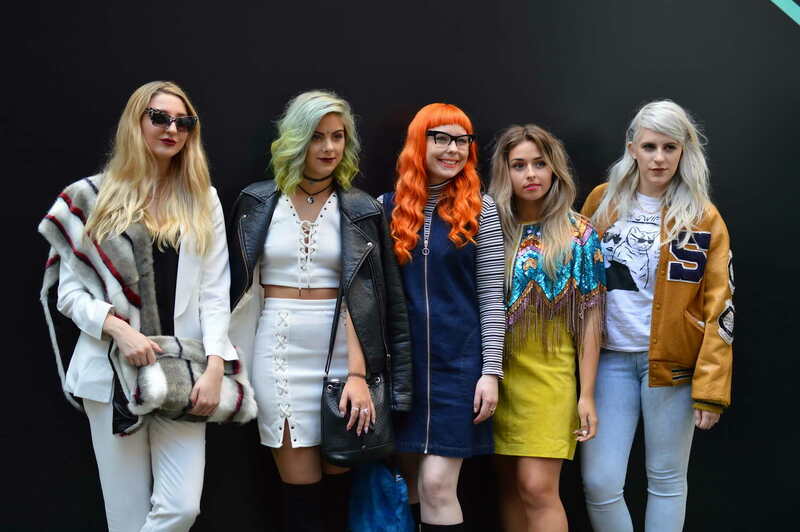 Here’s a selection of Rebel’s favourite street style outfits at London Fashion Week September 2014! This photo is an absolute cracker! I love her expressive eyes and attitude. Red and pink colour blocking is a great example of perennial style. These are classic outfits which oozes class. This is a style you can wear to the office: Comfy but stylish flats in sliver and monotone. Classic white blouse, pencil skirts and classic tote bags. Et voila, the ueber cool look is complete! I don’t love the entire outfit but it contains a few details I’d love to have in my wardrobe. 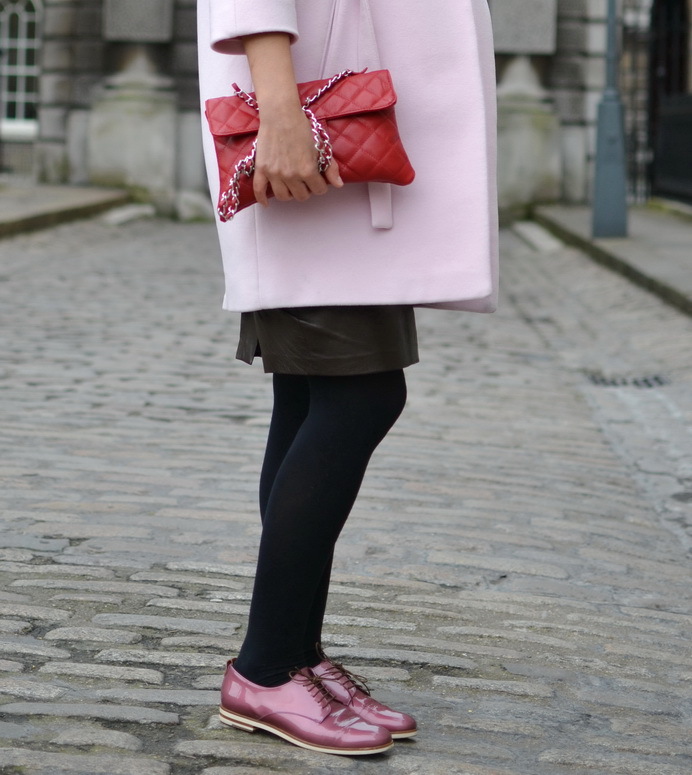 With the red Celine bag and the pink high heels, this fashionisto is dressed to kill! Romantique loves the cat ears. I ADORE the entire outfit of this lady. Her style represents everything that is effortless chic. Lace pencil skirt and pointy strappy heels. No loud colours, no frill. Just pure elegance. 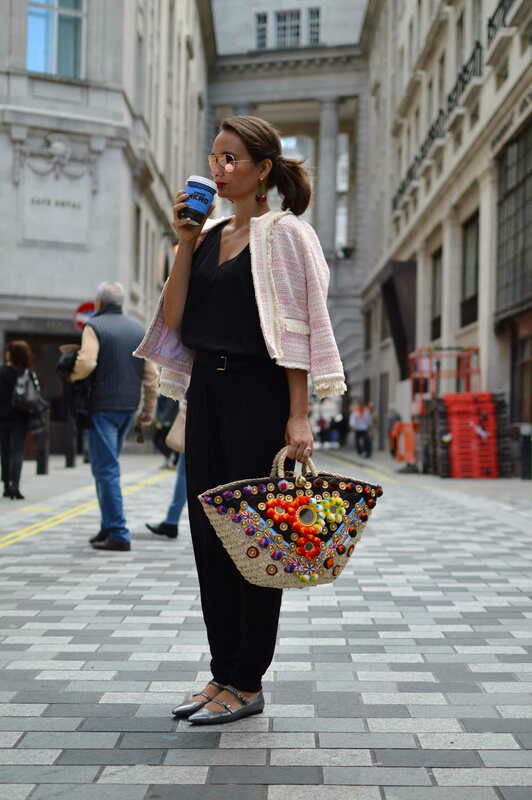 We bet this lady is not British but hails from Milan. These two remind me of the 70s band Baccara. The band consisted of two women, one always dressed in white, the other one always dressed in black. This stylish duo has taken the trend into the here and now by accessorizing it with Miu Miu sun glasses (left), fur and polka dots. Two things stand out for me in this outfit: The exceptionally well fitted purple pencil skirt and the mustard yellow teddy fur clutch. A hot combination of colours and fabrics. 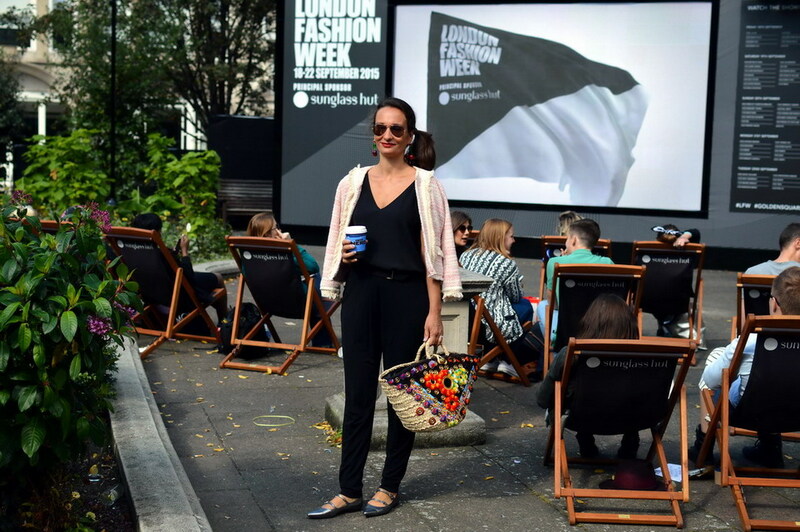 t’s fashion week in London! Rebel flew in from Hamburg, especially for the occasion, which meant lots of “girly nonsense” time, as Mr Romantique disparagingly refers to our chatter. 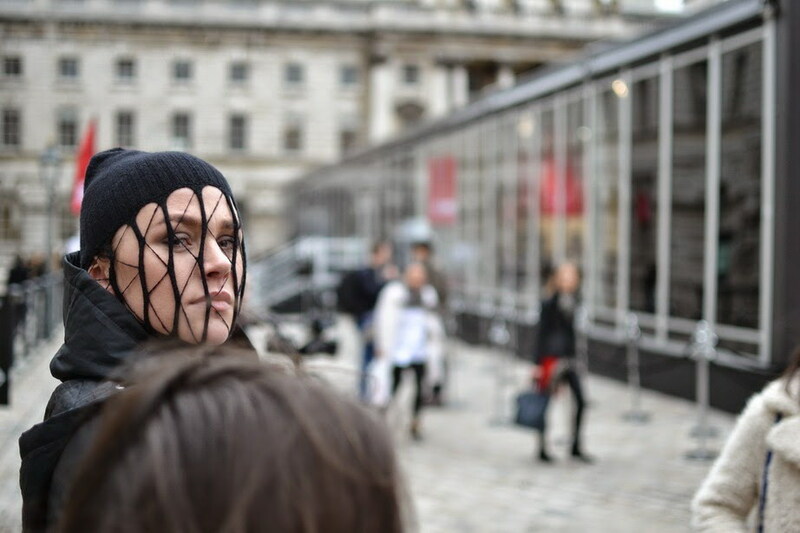 Twice a year, this festival of style takes place at Somerset House – one of London’s major cultural venues in the heart of the city. 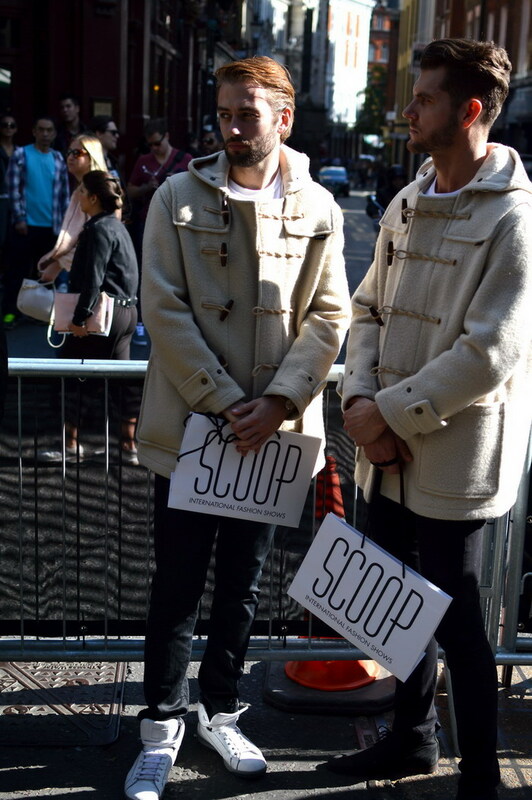 You don’t need show tickets to enjoy the London Fashion Week atmosphere. The courtyard of Somerset house is open to the public. 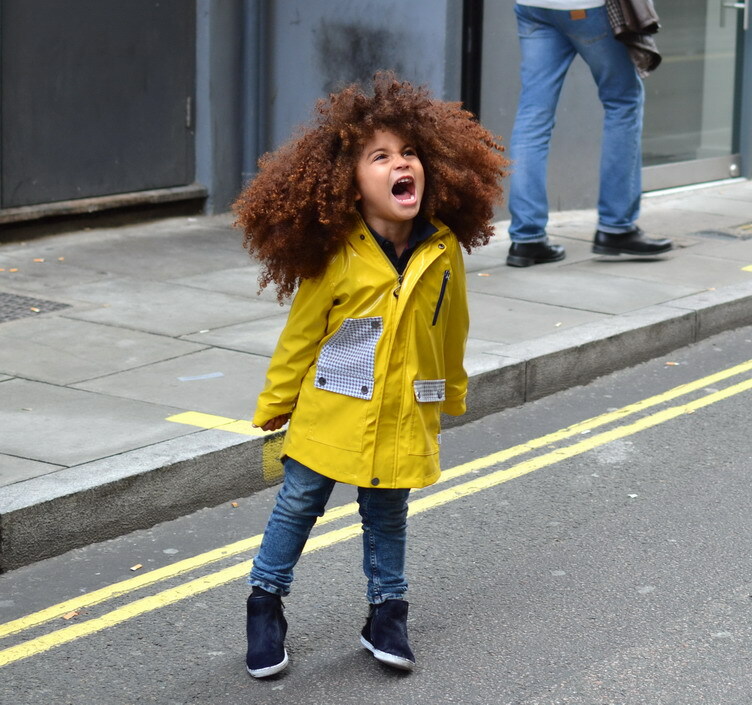 British fashion is known for its classic heritage brands as well as edgy eccentric South East London style reflected by the many fashionistas flocking to LFW. 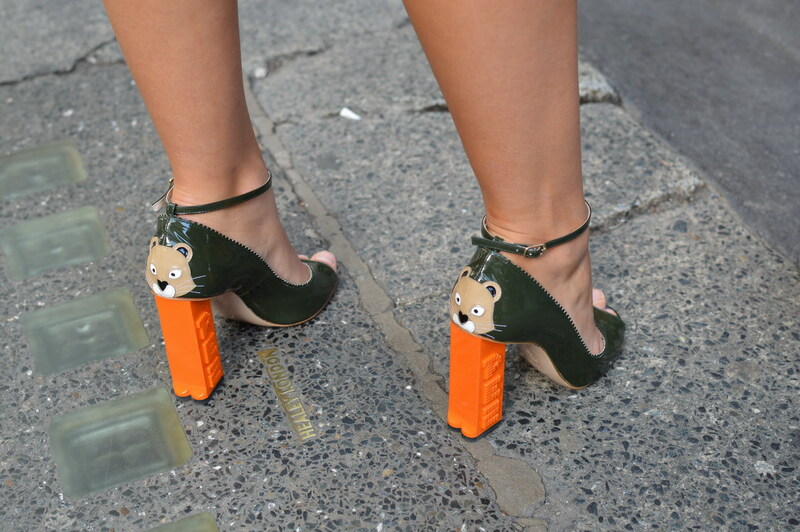 Stay tuned for a full run-down of our favourite’s LFW outfits. 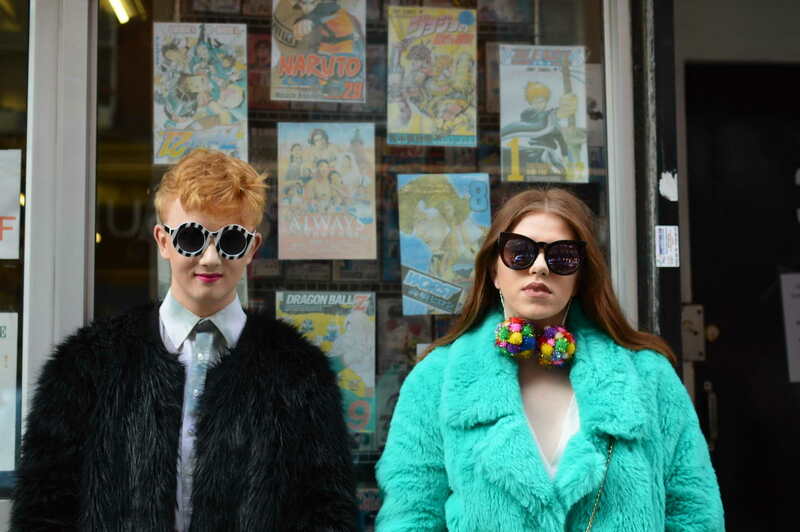 London is known for it’s gaudy, eclectic style, where everyone wants to stand out as unique. 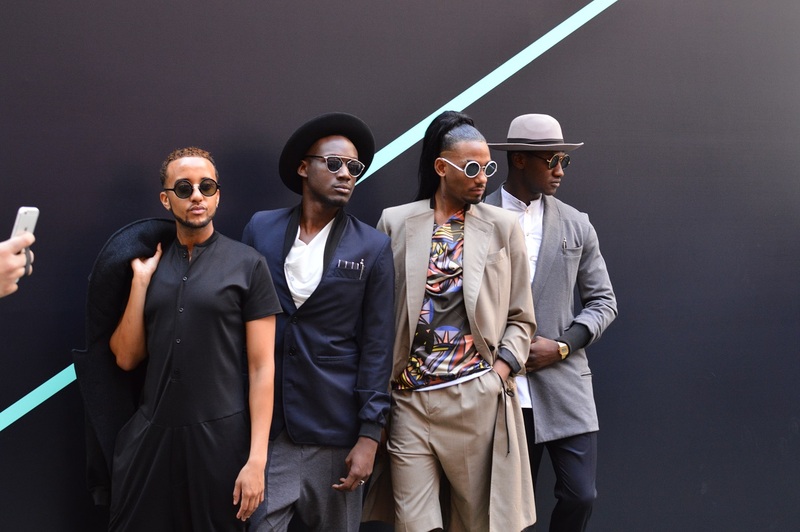 Rather than trying to keep up or even outdo the fashionistas, we dressed true to our own styles, picking wearable pieces that we might don in the office, whilst still looking slick. For us, every day may as well be a fashion show! 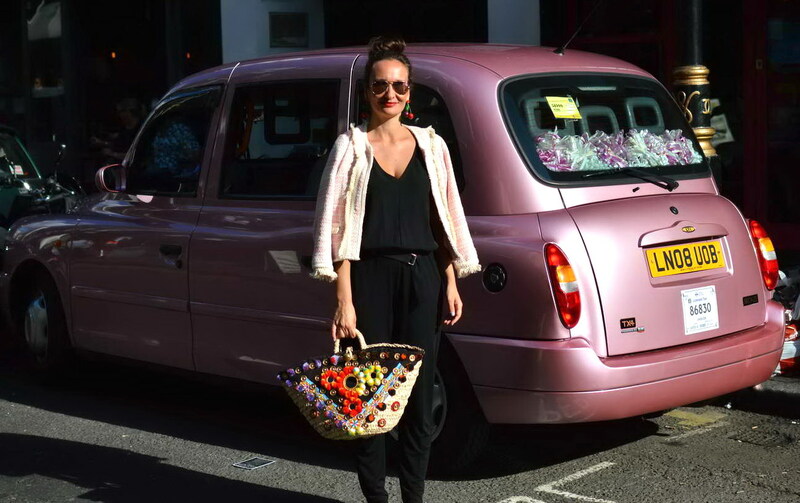 Rebel and I had lots of fun immersing ourselves in the eclectic London style mix, which we found to be a great source of inspiration. The French photographer loved my little French school uniform outfit!